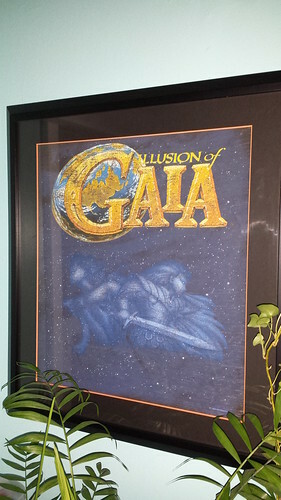 The Illusion of Gaia was not exactly a popular game, but I loved it. I rented it, but after my three days (remember when you could only rent from Blockbuster for three days?!?) were up, I went out and bought it. It even came with a free shirt, which I recently had framed. A part that stood out in my mind was the raft. At one point, the main character and Kara, the lead female character, are stranded on a makeshift raft. Unlike most video games, the point wasn’t to get off the raft. After all, you’re stranded. You can’t go anywhere. It is just you, the girl, the raft, and ocean as far as the eye can see. Most games would have you try to swim out to some secret area, or catch a ride on some passing dolphins, or something. But you were stranded. And you wait. Maybe someone will save you? At one point, there are fish jumping out of the water. When you hit them, she gets upset. She’s a vegetarian, you see. How could you hurt those innocent fish? I don’t remember if I felt guilty or annoyed at the time. All I know is that the scene changed. Actually, it was just another day on the raft. Another day of waiting. On the other hand, you’re starving. She’s starving. As brutish as she thinks it is, maybe eating fish is ok because it is necessary? Ben Franklin was a vegetarian, but even he agreed that if it was ok for the fish to eat each other, it should be ok for him to eat them. So you eat. And then the sharks came. They circled the raft. She freaked out. You’re ready for anything at this point. But they just leave. The sharks leave. When you think about it, the sharks would only attack if they were hungry. It gets you thinking about how humankind treats animals. Unfortunately, you don’t have too much time to think about what happened. One day, your character faints. After your rescue, you later learn he had scurvy. The scene lasted for 28 days. In real time it is of course only a few minutes, but for 28 days you are stuck on a raft. There wasn’t much to do, of course. What would you do if you were drifting in the ocean with nothing? You could only think. So I thought. I wasn’t just reading about someone else thinking. I wasn’t watching someone else in despair. I was there. Apparently most people hated this scene. They wanted to get to the action, I suppose. I liked it. If anything, this scene is the one that shows what games are capable of becoming. So if YOU’RE stranded on a raft in the middle of the ocean for 28 days with the female lead with nothing to do, what do you think you’re going to be doing? I mean really, does it take much thought? …. You’re going to be getting a horrible sunburn! What were you thinking, you sick person? This is a kids game! thats so true! i mean, its very understandable to be trapped on a raft for almost a month. who knows what could happen if it happened to you? this scene has you thinking, indeed. screw all you people who didn’t like that scene, you just dont understand that some moments in life dont require much action, although it was a bit romantic and that was what i didn’t like about it xD everything else about it was very good though. Thanks for your comments, Sora-Mage!